SPIDER-MAN Musical: 'Surefire Hit' or 'Epic Flop'? And you thought the Clone Saga was polarizing. Patrick Healy of the New York Times provided a detailed review of the Julie Taymor-directed production, reporting that the production was halted four times in the first act and five times total — the bad kind of showstopper — due to technical difficulties. After the fifth stop, Healy wrote that a particularly vocal audience member exclaimed, “I don’t know how everyone else feels, but I feel like a guinea pig today — I feel like it’s a dress rehearsal,” which was reportedly met with boos. Bono and Edge composed the music for Turn Off the Dark, and U2 fans have also chipped in with their opinion about the show. 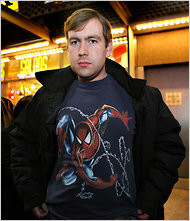 On fansite AtU2.com, Sherry Lawrence wrote that the music is “solid,” and specifically praised the work of Patrick Page as the Green Goblin. Over on Twitter, fan @nyindieguy had a similar take on the plot, calling it “basically incoherent” while praising the “spectacular” set pieces. Spider-Man: Turn Off the Dark stars Reeve Carney as Peter Parker/Spider-Man and Jennifer Damiano as Mary Jane. Six more weeks of previews are planned before the official opening night on January 11, 2011. Will you make it out to NYC for SPIDER-MAN: TURN OFF THE DARK?